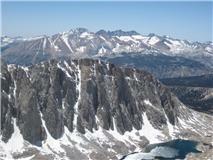 The so-called ‘High Sierra’ is the most renowned part of the entire 2,663 mile Pacific Crest Trail (PCT). This section, beginning at mile 703 at Kennedy Meadows, reaches the very highest points on the American mainland. PCT thru-hikers have traditionally entered the High Sierra on June 15, Ray Day. Going in before that time is considered dangerous due to the heavy snow melt and swollen streams. However, due to the record low snow levels in the Sierras this year, thru-hikers have already begun scaling the commanding heights of the Sierras en masse. This is a huge advantage to be able to enter the Sierras so soon, because it will give thru-hikers more time to reach their destination–the Canadian border–before winter. Bill Walker is the author of Skywalker–Highs and Lows on the Pacific Crest Trail (2010).